Last weekend I went to collect data from my logger. 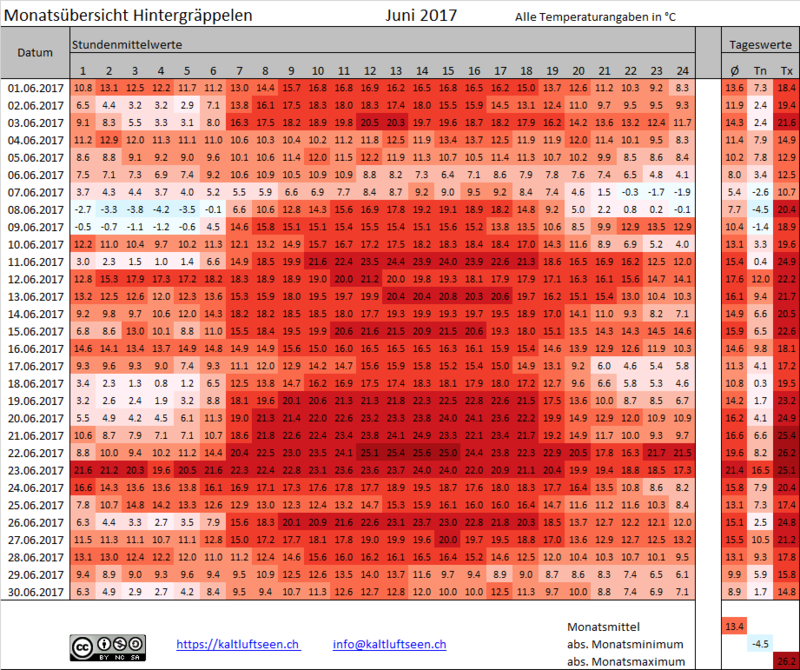 Winter has definitely gone: Sämtisersee had it's last frost on May 20 with -0.8 °C and Hintergrappelen on June 9 with -1.4 °C (plus an impressive -4.5 °C on the night before). Beside the very warm airmass the overcast sky was the main reason for the warm night. What happened in the (not so frosty) frost hollow in the Alpstein region? The blue line shows Hintergräppelen, the yellow line Sämtisersee lower station and the orange line Sämtisersee upper station. 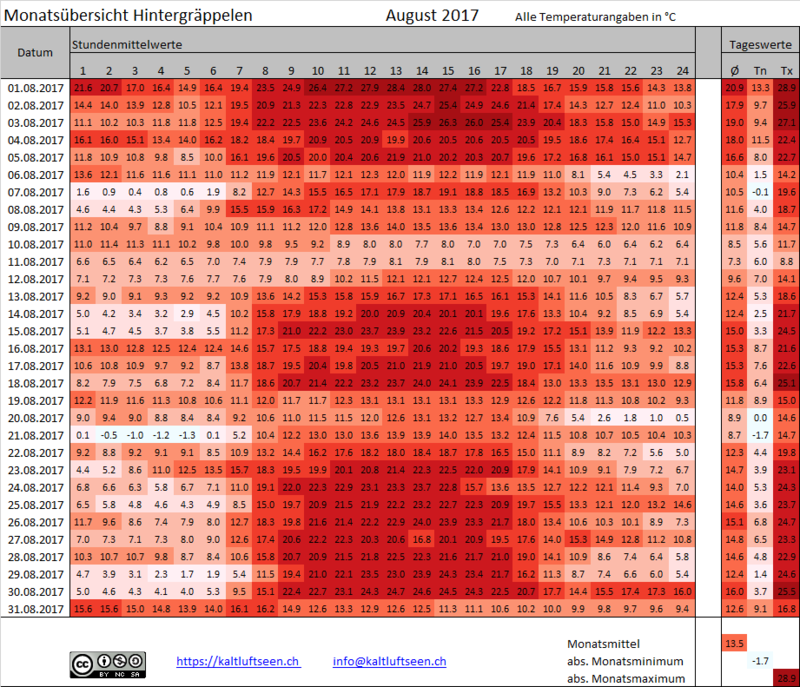 It was really surprising for me to see that at Lake Sämtis a tropical night (temperature > 20 °C between 18 UTC and 6 UTC) was only just missed. 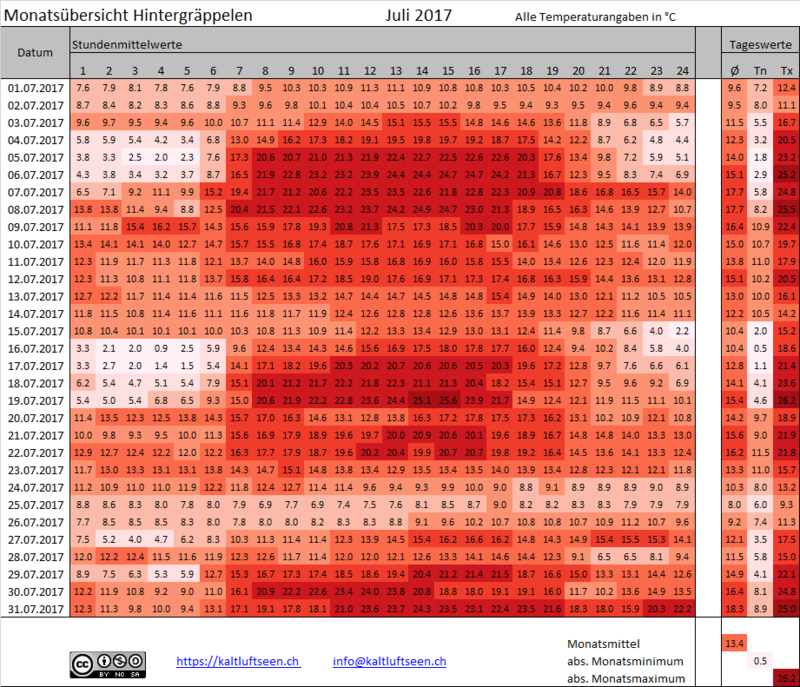 Hintergräppelen dropped > 7 K to ~15 °C due to a clear spell. Unbelievable minimum temperature in Lake Samtis! In our Campoluzzo frost hollow that night we had a "strange" minimum (due to overcast sky) of around 8°C. In the other nights, before and after, night's temperature felt down between -3°C and +1°C, almost every day. Exceptional value also in Lake Constance. You are right, also in Italy that value would be strange. 2 of 3 nights with frost is remarkable! At Sämtisersee (lake) as well as in Hintergräppelen (wetlands) we are far away from these values. I assume that Campoluzzo is a very dry frost hollow? Yes, it is absolutely a very dry frost hollow, similar to other frost hollows in Prealps' Northeastern Italy. The high plateau of Pale di San Martino (2500-2700 m a.s.l.) doesn't show such lows in summer. So we have another "real-time frost hollow", excellent. 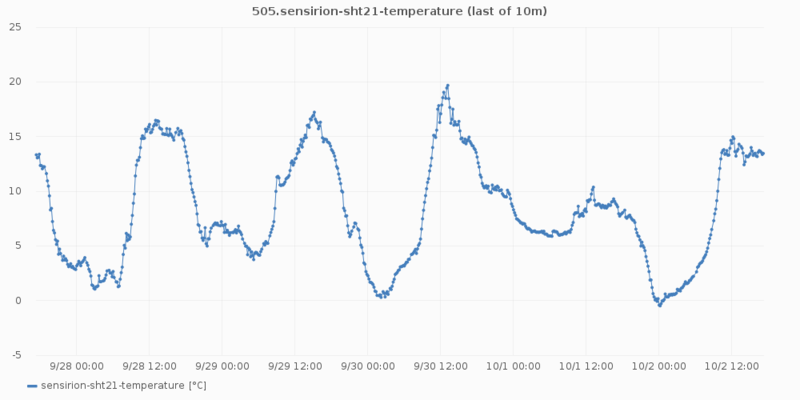 No problem to use the values from the Realtime-Sensor at Hintergräppelen in your list! 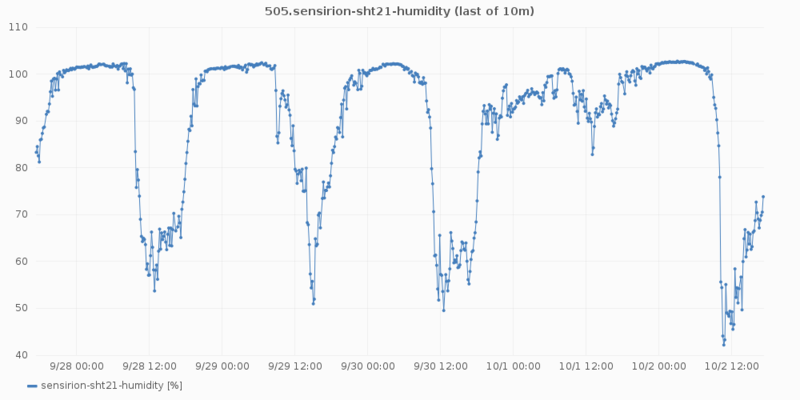 Perhaps a few addtional remarks regarding this sensor and the communication system that is used (I noticed the contributions under http://forum.meteotriveneto.it/showt...-corso/page176 but didn't wanted to contribute in English there since it is an Italian forum). My draft conclusion is that it is very attractive to have real time values available - but with the current setup it is not a replacement for the datalogger which will remain as reference. just a short update: the frost hollows in Northeastern Switzerland are finally in winter-mode: some 50 cm of snow last Sunday and Monday delivered a good basis for the first notable minimas. 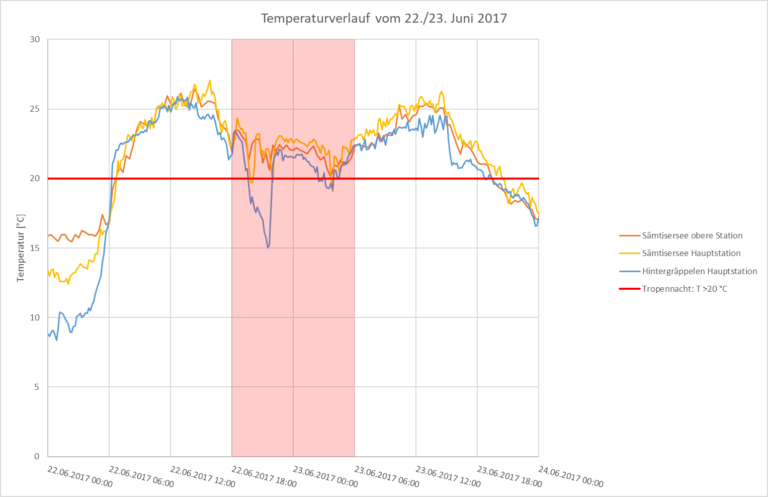 At Hintergräppelen I had minimas of -21.9 °C, -21.5 ° and again -21.5 °C on 3 consecutive days. Even more notable is the first Persistent Cold Air Pool phase on November 15 with a maximum of -10.5 °C.